Apparently some new evidence has turned up supporting a biological origin rather than geological. As one who is fascinated by the possibility of life on another world, I am anxious to review the latest findings. But realistically, I don't expect anything conclusive to come out of this. Like the last time this happened, the scientific community will be divided and we'll see considerable controversy unfold. All part of the scientific process. But maybe, just maybe something positive will transpire. Perhaps someone in the Obama administration will be sufficiently impressed with the findings to authorize additional funding for planetary science, especially for the study of worlds that potentially harbor life such as Europa and Enceladus. It would be great to discover life on another world within the next 15-20 years when I'll still be around to enjoy it. It sure feels like it. Like Sagan said, "extraordinary claims require extraordinary evidence. ", so this thing is going to be debated for a long time I'm sure. And even if all signs to end up pointing to biology as the winner, I'm sure we'll need something on Mars, detecting these fossils. Sirius_Alpha wrote: "extraordinary claims require extraordinary evidence." Actually that is is not true at all. Sagan's statement in itself is very ambiguous and causes more confusion than clarifies. Few scientists would attest to it. Ordinary unambiguous proof would be sufficient. Keep in mind we have trouble tracing the fossil record of life much beyond 2-3 Billion years even on Earth (even allowing for erosive processes). Most of our evidence on very early earth life is taken from the byproducts and chemical analysis or organic residue, all of which could have been produced naturally. Even on Earth science would say we do not have unambiguous 'fossil' evidence for life from 4 Billion years ago. This is their essential dilemma. 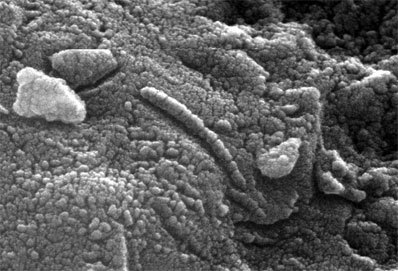 There aren't many accepted processes for identifying very primitive life from so far back yet. It could be argued that unambiguous proof of life would itself be extraordinary. Whether it be if a Mars rover/lander images a herd of animals, or a live single-celled organism, I don't see how it's not going to be extraordinary. Wow, this seems to have potential, but again, I'm pretty sure that's what I said the first time, I do hope that someone important takes notice this time.